I am not an atmospheric scientist. But I thought I could introduce some explanations about the recent measurements that are seemingly contradictory to the IPCC reports (AR4 and upcoming AR5). First, does this year's Arctic ice cap that is reportedly 60% larger than the last year's mean climate is cooling? Not so. It is just a symptom of the so-called 'regression toward the mean' bias. Let's look at the measurement data. 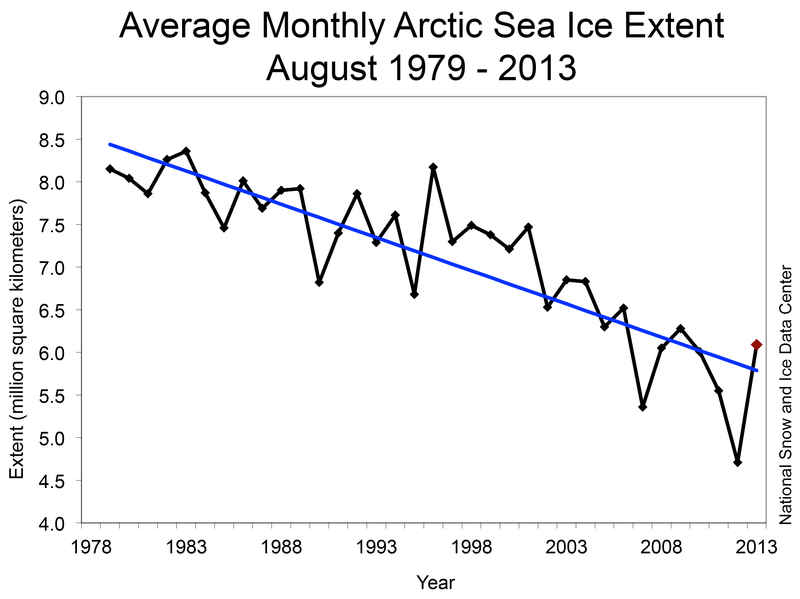 The 60% increase in 2013 is just due to the record-contraction of the Arctic ice cap in 2012 (Meier, 2012). The downward trend is still valid. Source: National Snow & Ice Data Center. Second, does the hiatus of global warming since 1998 mean that the IPCC's forecasts are outright wrong? Not so. Their models were found wrong in that they couldn't predict the anomaly (How much the models were wrong can be found at Fyfe et al., (2013)). However, the overall global warming is happening exactly as the IPCC has been telling the world. "Although similar decadal hiatus events may occur in the future, the multi-decadal warming trend is very likely to continue with greenhouse gas increase." I think this study is a good answer to the so-called confusion between the short-term noise and the long-term change.